This group conversation will be a unique opportunity for a diverse group of participants from the South Bronx and a select number of correspondents from the greater NYC community to further discuss questions from the survey. The discussion will be moderated by members of Work Progress Collective (WPC), and refreshments will be provided. 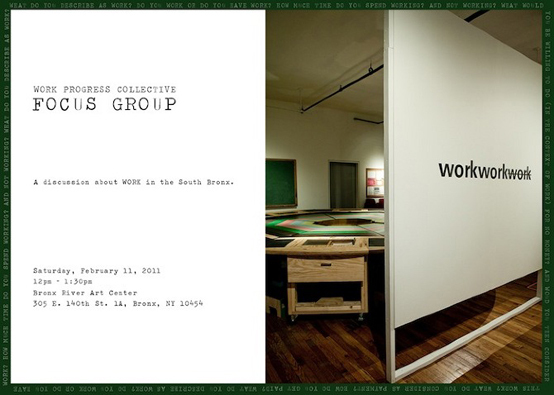 Work Progress Collective (WPC) is a hybrid identity, equal parts artist, journalist, political activist, archivist, and curious observer. WPC acknowledges the contemporary condition of art making—looking beyond the traditional artistic boundaries that place participants inside or outside, the model considers an active, implicated audience, performing collectively.